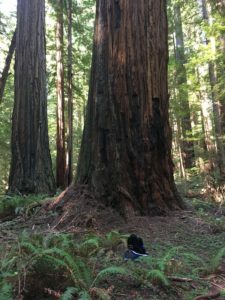 Record Breaking Redwoods Outside the Redwood National and State Parks? NASA maintains a global canopy height map on its website. This map is comprised of airplane based LIDAR mapping (2.4% of land mapped for canopy height) and satellite based “spectroradiometer” equipment (97.6% of land area mapped for canopy height). The canopy height is appropriately in shades of progressively darker green with the darkest green indicating at least eighty percent of the tree canopy in the area is over 70 meters (230 feet). 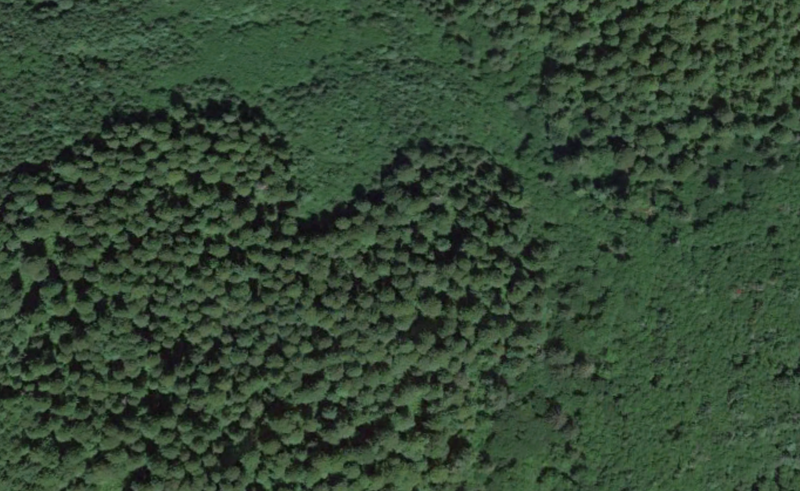 All the dark green areas in northern California are old growth redwood stands. The average tree height in old growth stands in northern California is 250-300 feet, with maximum demonstrated individual tree height at 380 feet. To see more on this subject see my posting on “Distribution of Tree Height in an Old Growth Redwood Forest”. Below is a portion of the Global Canopy Height map that includes the area from Fortuna to Klamath. 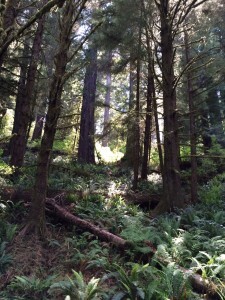 The dark green (old growth redwood) forests have been noted from north to south. 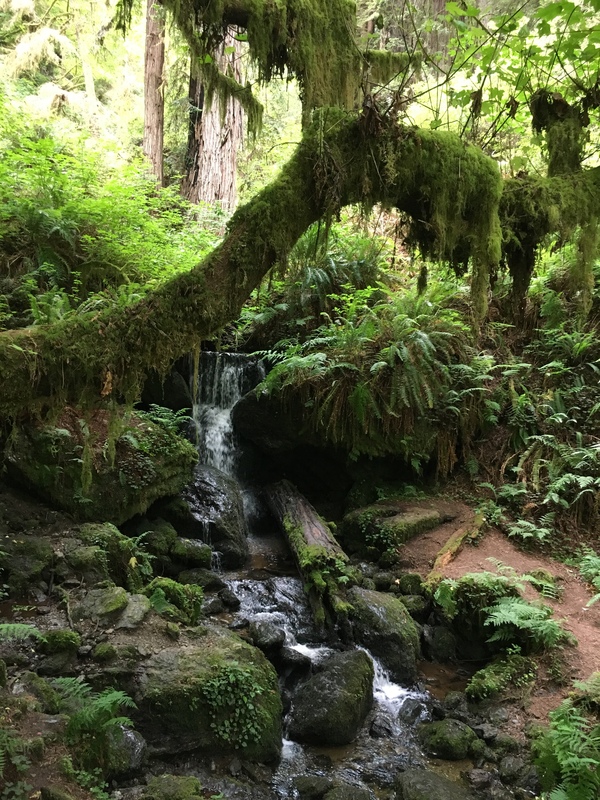 The old growth forests include Prairie Creek Redwoods and Redwood National Parks. No surprises there. 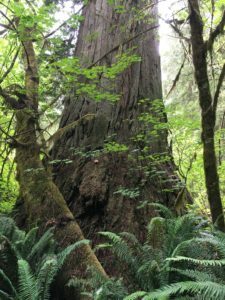 However there are five additional areas with large enough tracts of old growth redwoods to be discernable on the global canopy height map. You can click on the map to see a larger version. 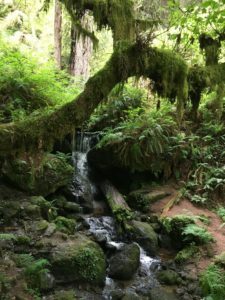 From north to south here are some comments on the lesser known areas with old growth redwoods forests. 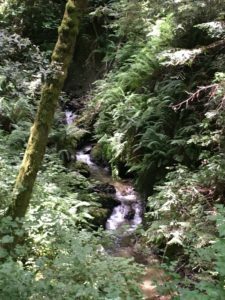 This area is low elevation and is protected from the ocean by a large ridge and has riparian zones along High Prairie Creek. These are perfect conditions for large and tall redwoods and indeed there are many large tree crowns in this area as seen on Google Earth. 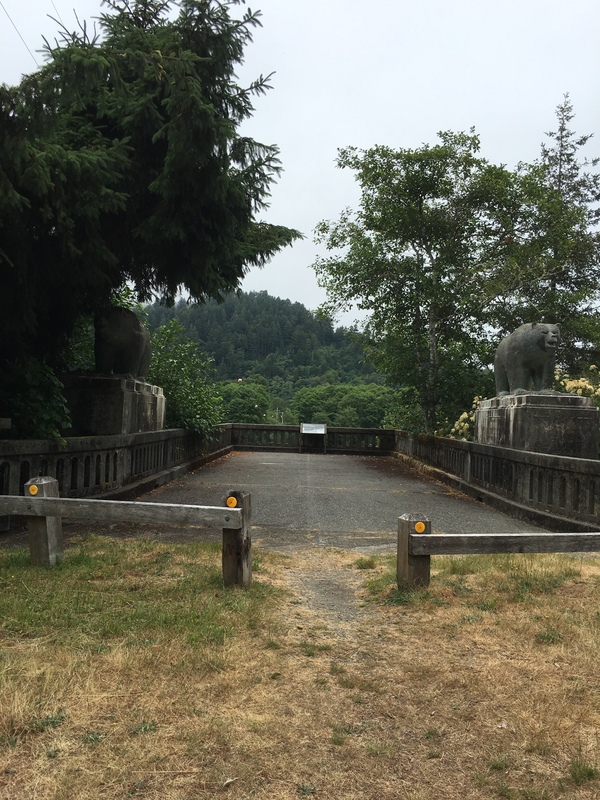 This area does not have any public access and most requests for special access will be declined. 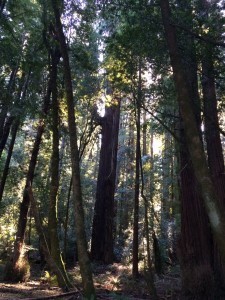 This could be the best area for old growth redwoods between Prairie Creek Redwoods State Park and Jedediah Smith Redwoods State Park and the trees in this forest are representative of the redwoods found in those parks. The GDRC dominates timber holdings north of Eureka while HRC has extensive holdings around Eureka and south. Both these companies provide detailed publicly available management plans and holdings maps. Most of their holdings are managed second growth but they do have some old growth forests. Any old growth areas of three acres or more are voluntarily and permanently protected from harvesting and road construction by both of these companies. I am not familiar with the access requirements for these areas but certainly written permission would be required from the respective company. 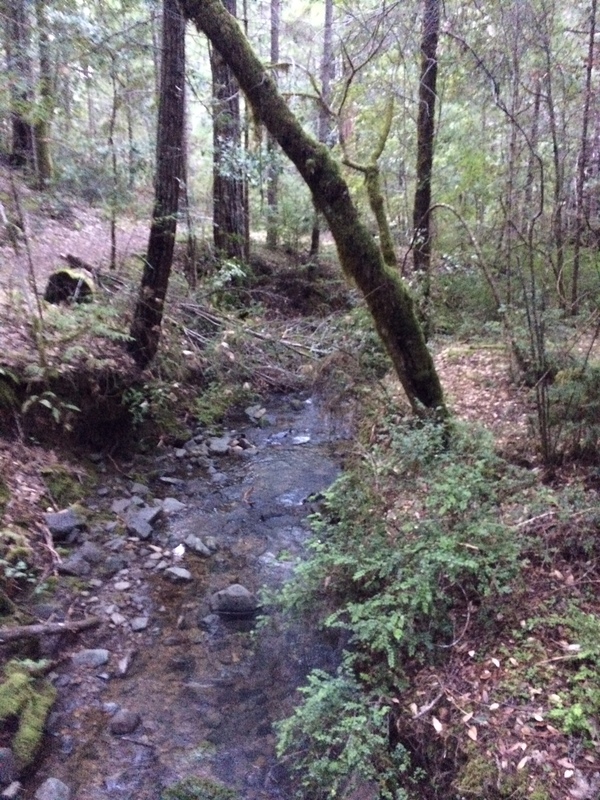 Some folks call this the “mysterious Headwaters Reserve”. 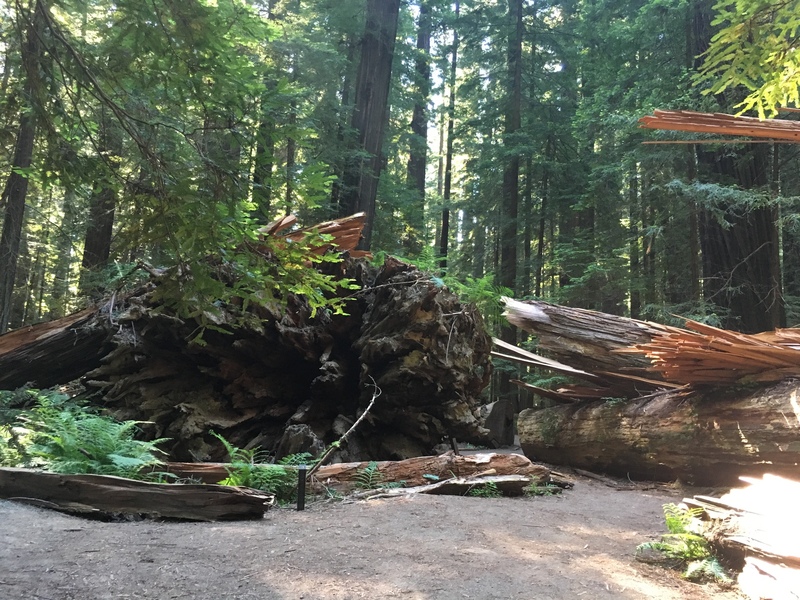 It was the scene of some famous forest protection protests in the 1990’s and culminated in 1999 with a $380 million purchase of 7,000 acres from the owning lumber company, of which 3,000 acres are old growth redwoods. The purchase was 100% taxpayer funded, $250 million from the Federal government and $130 million from the state of California. The Reserve is managed by the Bureau of Land Management. The Reserve does have public access though it is limited. There is a north approach which requires a five mile hike or bike from a parking area to reach the heart of the reserve. Then there is a south approach from near Fortuna that requires a reservation and meeting up with a representative of the reserve. 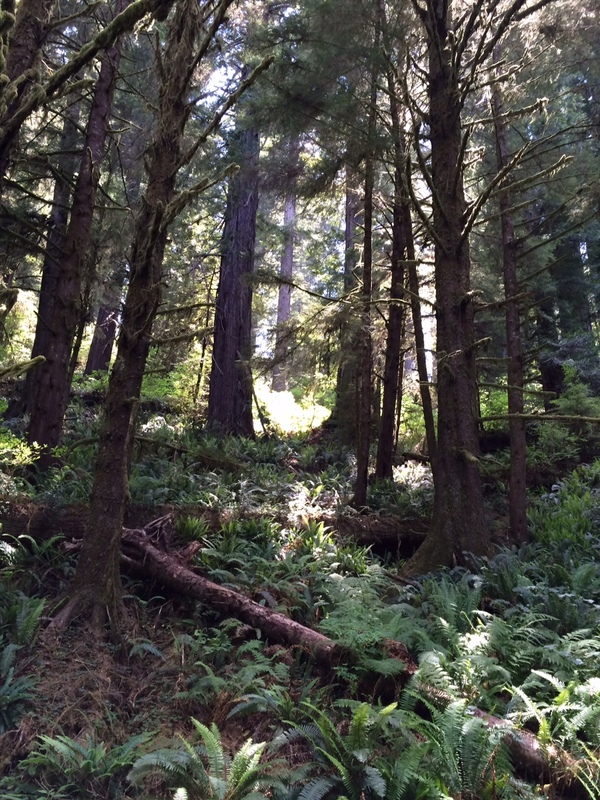 This reserve contains a few redwoods in the 360 feet height range. 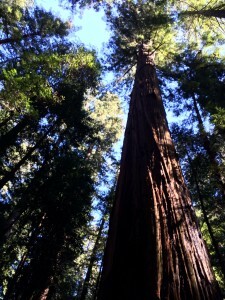 This is exceptionally tall, there are less than sixty redwoods throughout their range that are over 360 feet in height. Undoubtedly there are exceptionally large diameter and volume trees in this reserve as well. 3 Record Breaking Redwoods Outside the Redwood State and National Parks? Any of the lesser known areas highlighted above could hold a record breaking tall redwood tree. It is not likely but there is a chance. 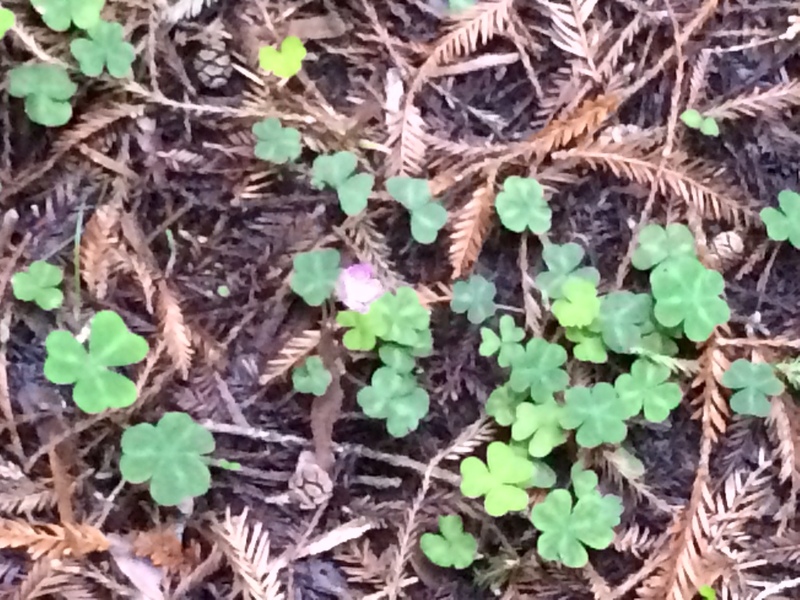 As one well known redwood explorer writes – “chance has potential”. Based on the existing information on tallest redwoods, a super tall redwood can grow anywhere from near sea level to around 900 feet in elevation. That covers a lot of ground. 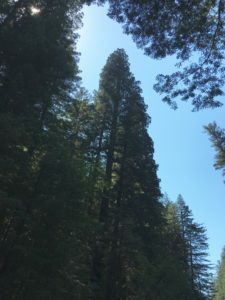 As long as the soil is good, there is some protection from wind from surrounding trees and hills, and there are year round water sources (nearby creeks, springs, and fog drip) a very tall redwood is a possibility. 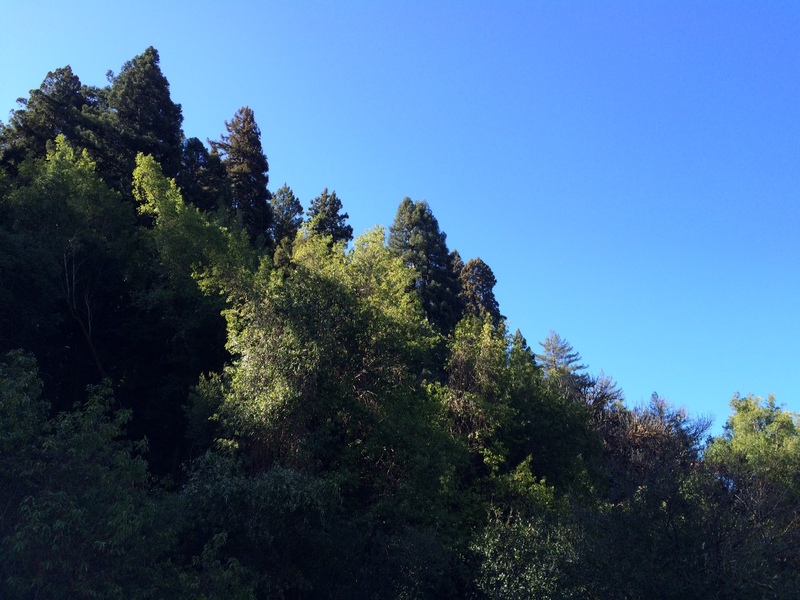 Then to increase the possibility there needs to be a forest of trees growing in conditions for super tall redwoods. 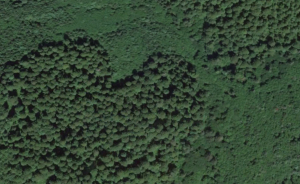 Each of the lesser known areas outlined above contains such a forest, as confirmed by the NASA global canopy height map. 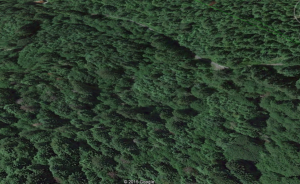 For the same reasons there could also be very large (over 20,000 cubic feet) redwoods in these areas as well. 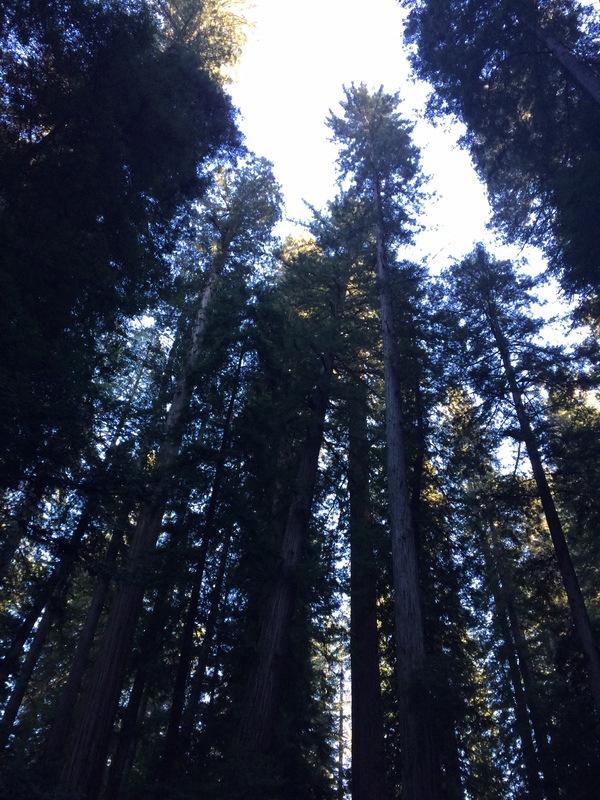 Old growth redwoods – that phrase invokes a lot of different feelings in people. Certainly in the present the phrase describes the large never cut forests in the redwood parks. Forests full of giant trees, some by rivers or streams and others along hillsides. Forests covered with needles and sorrel and forests covered with ferns. Forests with deer moving through them to reach the creeks, all the while shadowed by mountain lions. Forests with black bear dens. Remote and rugged but never more than a few miles from a highway. 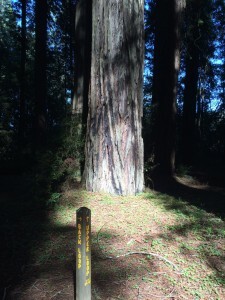 The redwood density figure is a general rounding of the findings in a redwood plots study underway at Humboldt State University. If that number seems too high, well…. Here are two pictures. 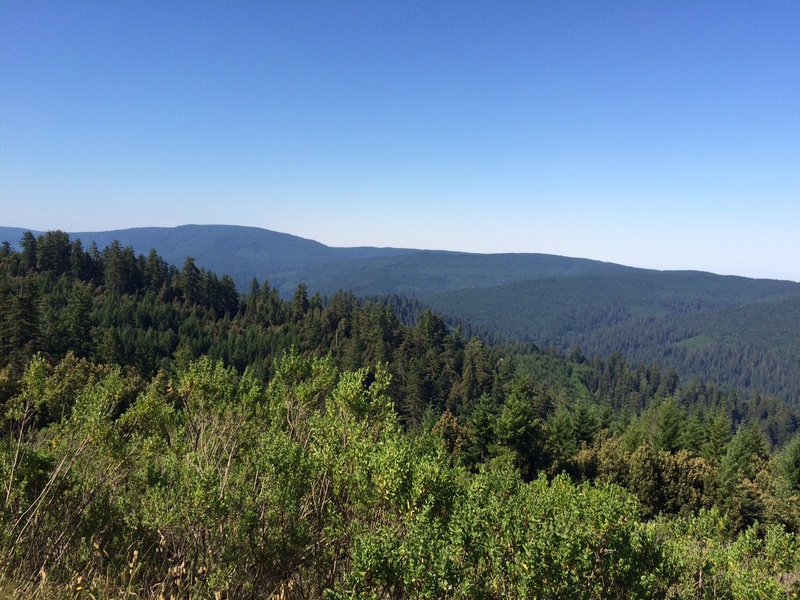 These are from the Redwood Creek Overlook on Bald Hills Road in Redwood National Park. 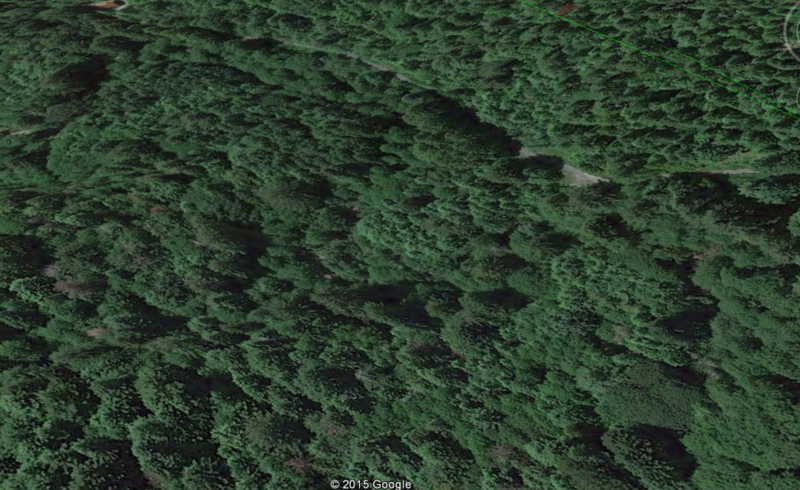 The old growth forests and patches are very distinctive. If you go to that overlook and put a strong pair of binoculars on those forests it is an impressive site. Many big and tall trees all growing along Redwood Creek and the surrounding feeder creeks and hillsides. I can’t imagine a more spectacular forest. It is kind of intimidating. Redwood Creek Overlook looking west northwest. 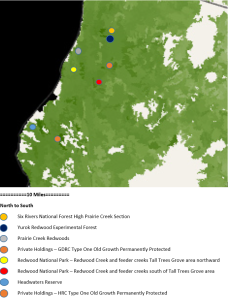 Thorough ground based searches combined with LiDAR technology have given a pretty complete picture of tree height in all parks with the exception of the Headwaters Reserve. 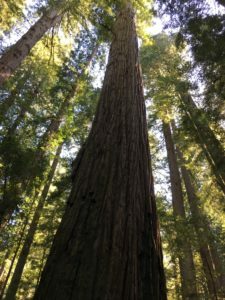 The tallest redwoods, those over 365 feet, are all in Humboldt Redwoods State Park and Redwood National Park, with the exception of two trees in the exceptional Montgomery Woods Reserve. 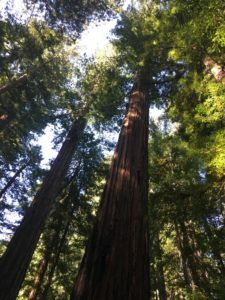 Then all the trees over 370 feet (there are only ten or so) are in Humboldt Redwoods State Park and Redwood National Park. Trees over 350 feet. Each line represents a tree. There are two things that are apparent when viewing these graphs. First, the distribution patterns are very similar between the parks. 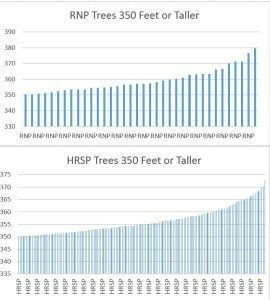 And second, there are a lot more tall trees in HRSP than in RNP. 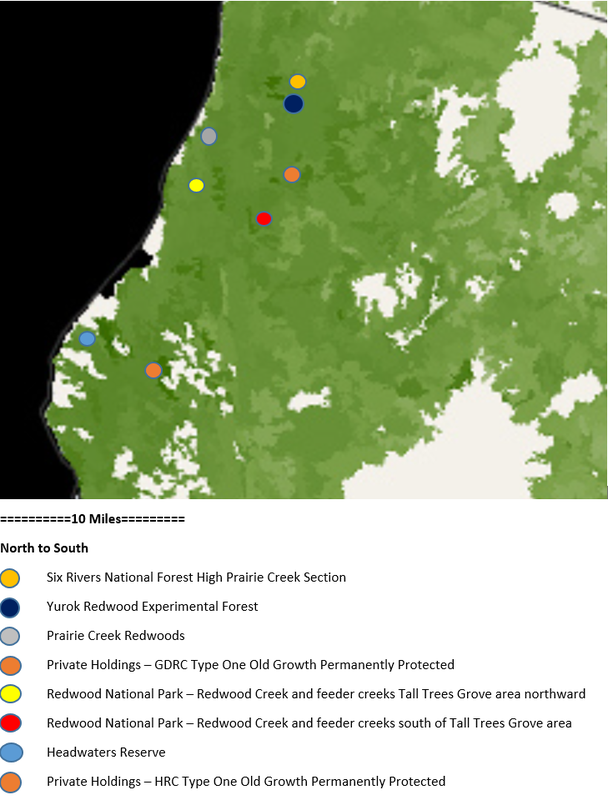 Based on this data paired with the history of each park the explanation is certainly this: In Humboldt most of the forests with the tallest trees are intact. 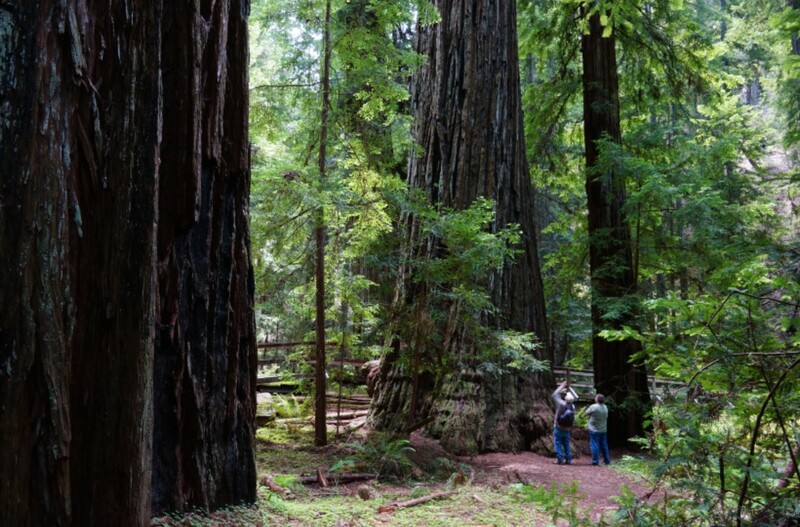 In Redwood National Park most of the forests with the tallest trees have been thinned or removed. 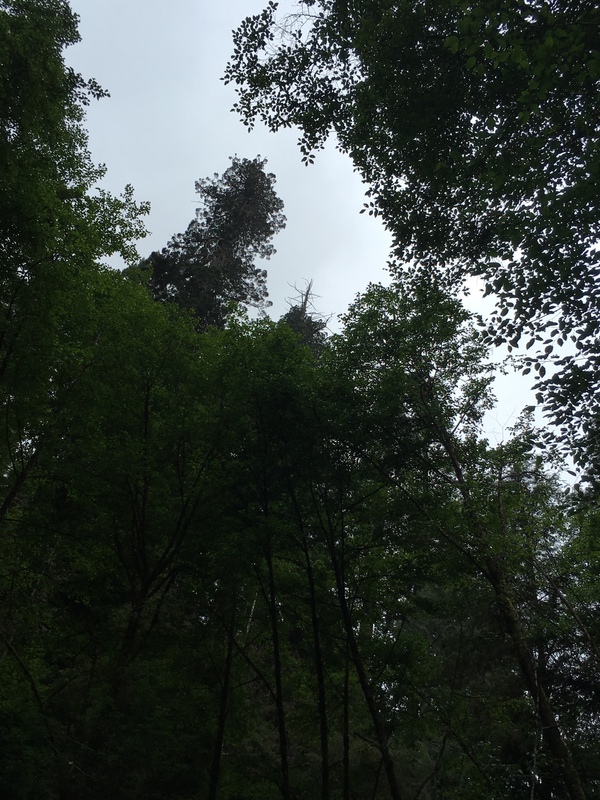 Noting the steepness of the curve on the tall trees graph it is evident there is some type of “bell shaped” distribution where there are many trees of a certain height, say 350 feet, then the trees get fewer and fewer at 360 feet and even more scarce at 370 feet. 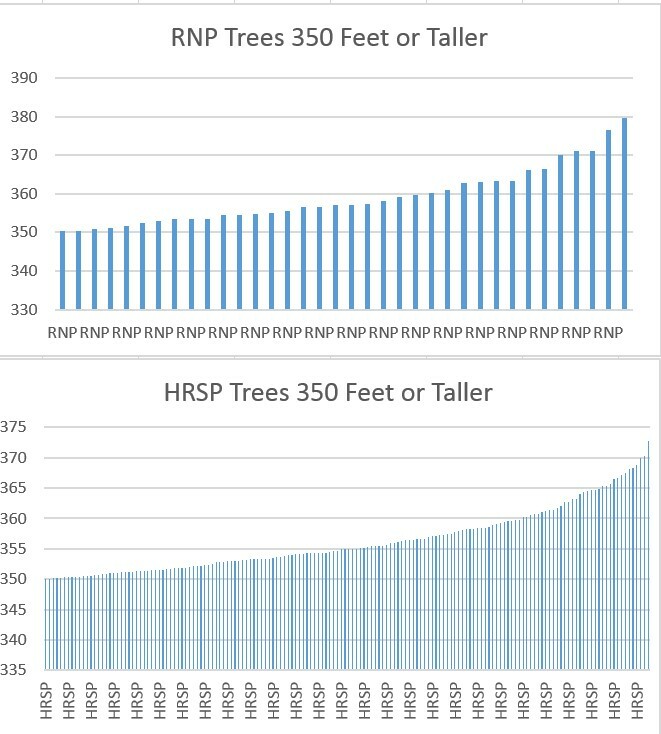 Looking at the results of expected trees versus actual tree populations, it is evident four standard deviations describes 368 feet or so redwoods, while 4.5 standard deviations describes the very tallest redwoods (380 feet). Then with some calculations and interpolation, we can arrive at three standard deviations corresponding to a 338 foot redwood tree. 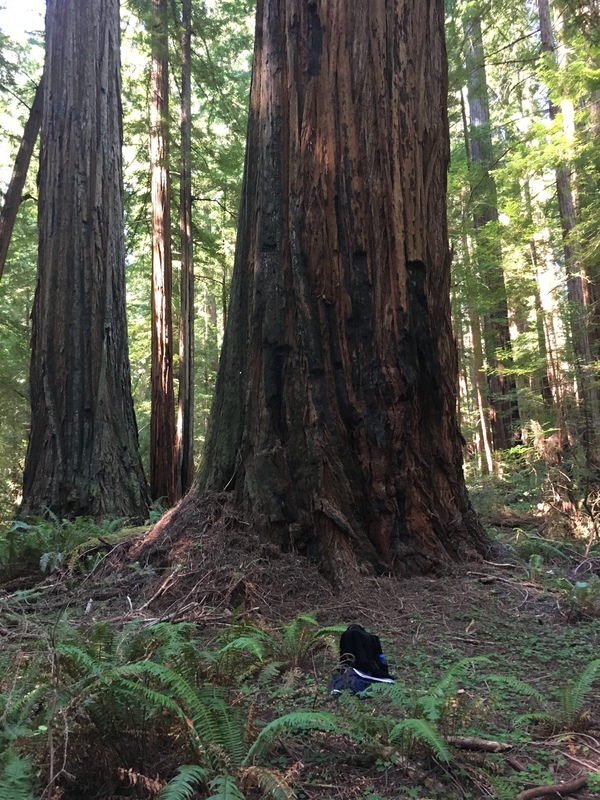 This then results with the following very approximate distribution of tree height in old growth redwood forests in Humboldt Redwoods State Park and Redwood National Park. 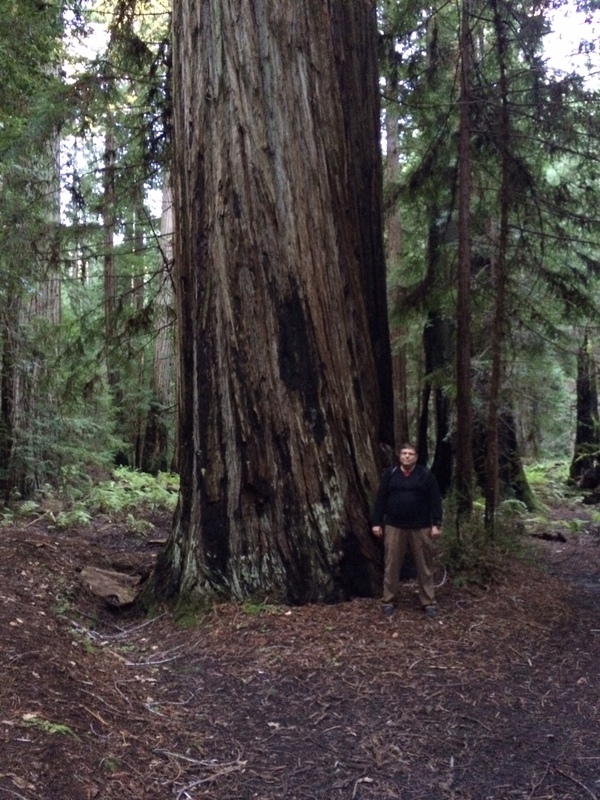 So the average old growth redwood in Humboldt and Redwood NP is 250 feet tall. Remember this covers all old growth trees at all elevations that are at least 3.28 feet in diameter. Then there are 1,000 trees over 338 feet in height. 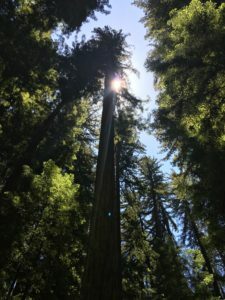 For some closer in views of old growth, here are pictures from two of my favorite areas in the redwood parks. There are views like this all over the redwood parks. 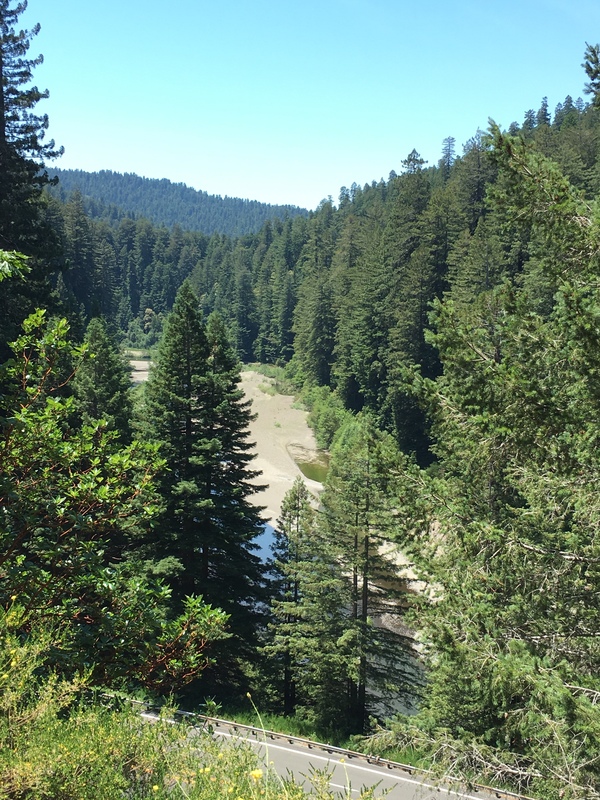 Montgomery Woods State Natural Reserve is a very scenic spot with a high concentration of very tall redwood trees. The tall trees list shows 17 trees in this reserve over 350 feet in height. The tallest redwood in the reserve (Mendocino Redwood) is about 368 feet tall and is the 11th or so tallest tree in the world. 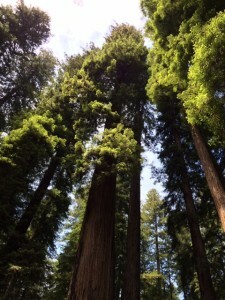 The tall trees over 350 feet are found throughout the reserve – in the lower, middle, and upper flats. But that is a small area – a long stretched oval about 1.5 miles around and only 150 or so yards wide. 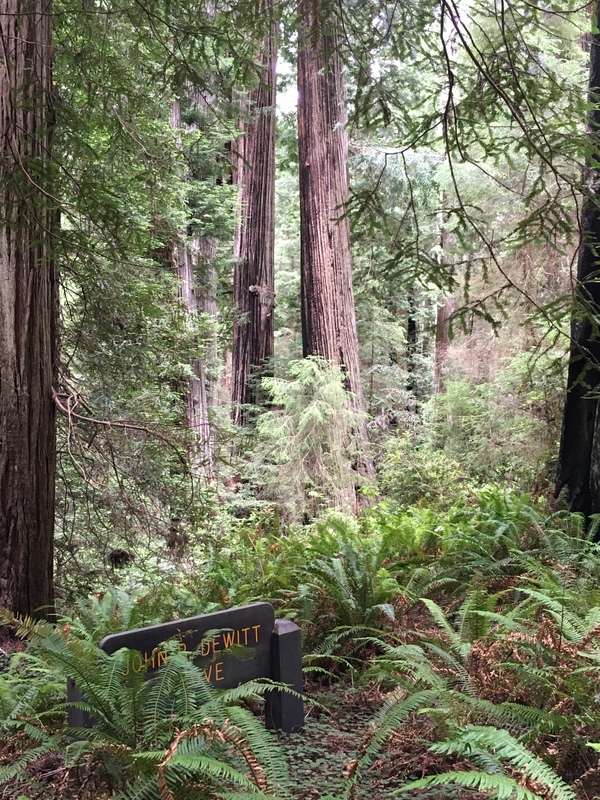 I had the fortune to recently hike through this reserve with Jerry Beranek. Jerry is a noted redwood photographer and writer who has published several books. 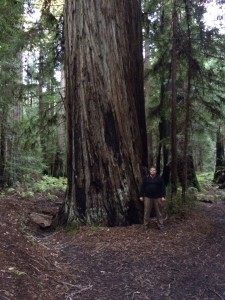 His book “Coast Redwood – Tree of Dreams and Fortune” is a must have for any redwood enthusiast. 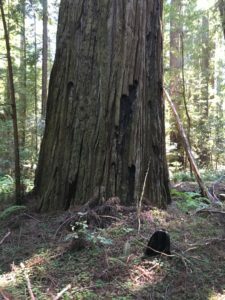 It contains many great pictures of redwood trees as well as lots of information on the trees, plants, and animals that coexist with redwoods. Jerry points out Montgomery Reserve may have been a lake at one time. A landslide could have backed up the creek for several centuries or thousands of years, allowing the shallow lake to form. 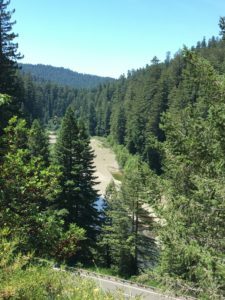 Then the natural dam let go, the lake drained, and the rich soil was populated by redwoods which grew tall in the protected valley on the north side of a coast range mountain. As he mentions the redwoods needed to “stretch” to get up above the rim of the bowl and get more sunlight. This picture is from the area at the start of the grove after hiking up the hill from the parking lot. You can see the evidence for a long ago earthen dam (I am standing on it) as well as the beauty of the grove. 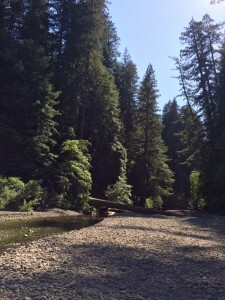 Montgomery Creek winds through the flat area with tall redwoods uniformly distributed throughout. There was a large fire in this reserve in 2008 that burned the undercover (it has since fully recovered) and some of the hardwoods on the slopes above the flat (they didn’t make it). This fire was part of a group of wildfires that occurred in July that were very destructive to Mendocino County. Most of the redwoods came out ok as one of their specialties is fire survival given their thick bark. However a few of the hollow redwood trees sustained significant damage including one really big one that burned for days like a giant smokestack and then collapsed. 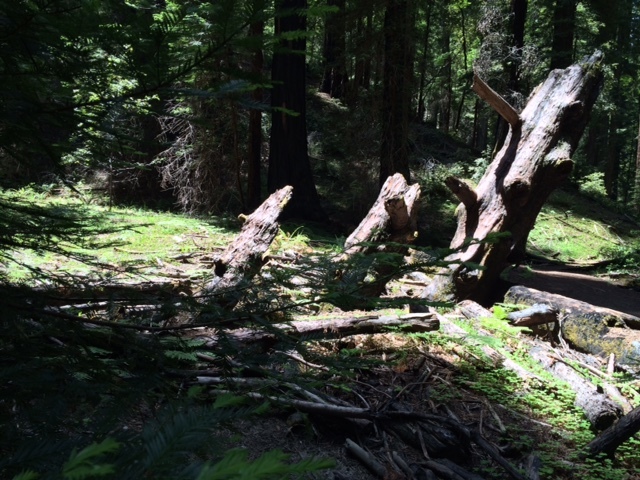 As part of the collapse event one huge branch splintered into three sections as it crashed to earth. Each of the three sections entered the ground at about the same angle. These branch sections are still buried in the earth – three big widow makers. They are pictured below. The biggest and fourth tallest tree in the reserve is the Montgomery Giant, with a diameter of 17 feet and a height of 361 feet. Jerry and his buddies did some climbing in this reserve in the 1980’s. In 1981 Jerry climbed the Montgomery Giant and measured its height via tape drop at 357 feet. While at the top an even taller tree in the distance was noted as the tallest tree in the reserve. 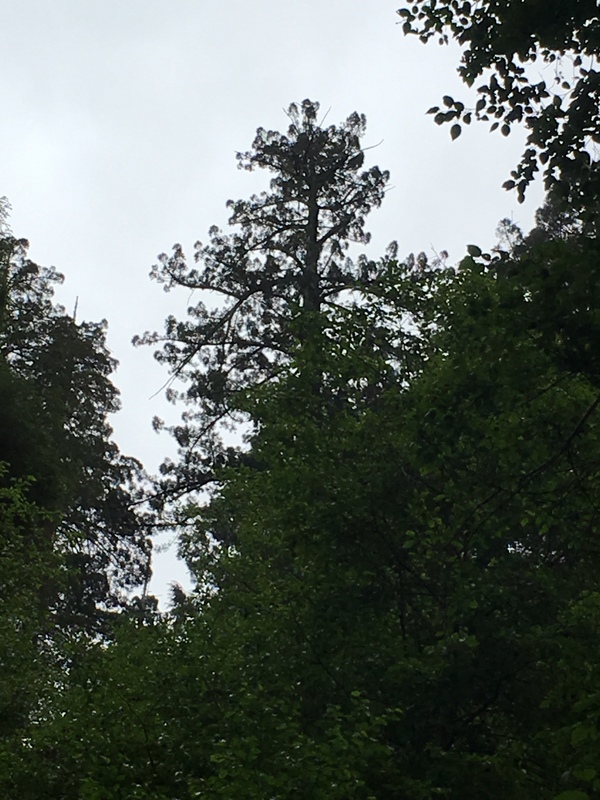 This tree was assigned the name Mendocino Redwood in the 1990’s and for a few years it was the tallest known tree (before the Stratosphere Giant was identified). Here are two pics of the Montgomery Giant. The first is a mid to upper trunk view. Then the second is of Jerry and I having a discussion on how to get a fish line over the lowest branch in the tree. 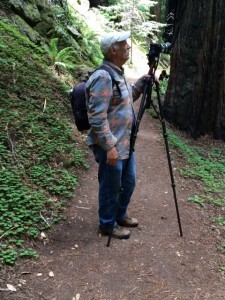 Jerry, like some other redwood enthusiasts, hikes with a tripod and camera. Here he is checking light while setting up for a photo. 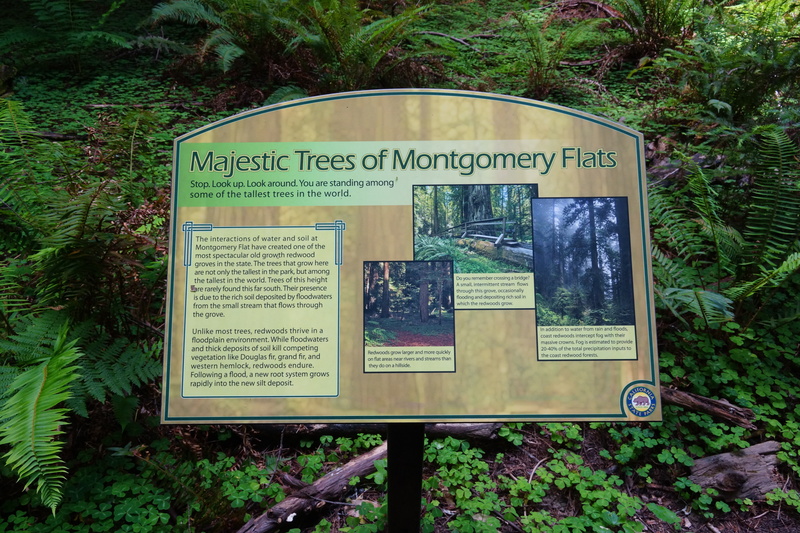 Recently eight of so interpretive information signs have been put up along the trail. They are well done. Here is one of them. Montgomery Redwoods Reserve is a great hike. This was my second hike there and both times I was lucky to hike with someone knowledgeable about the reserve. 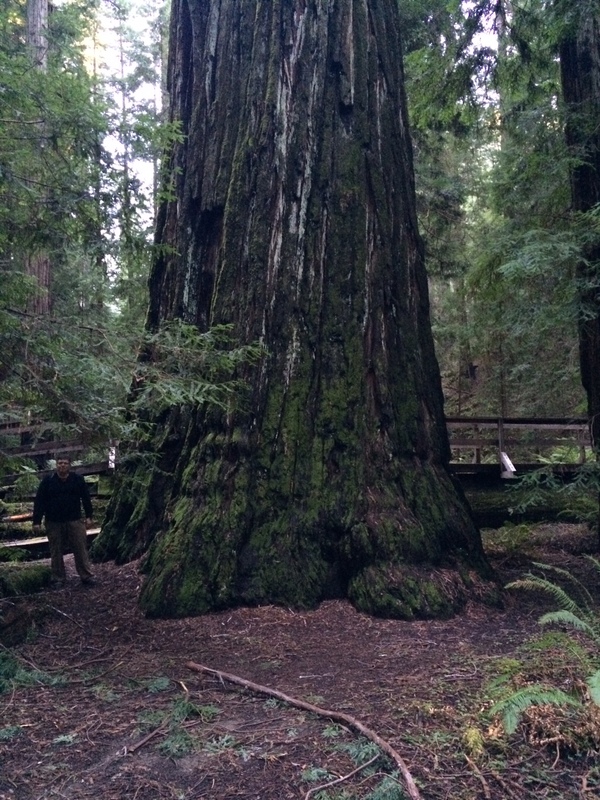 Jerry’s knowledge of and experiences in the redwood forests are impressive, interesting, and entertaining. 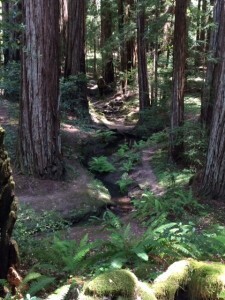 Mendocino County is noted for its wineries, microbreweries, and coastline but also retains some remnant redwood forests. On one hand these forests are not as extensive as the ones further north but on the other hand their smaller size makes them easier to thoroughly explore. Also since they are remnants of the once great coastal redwood strip they are surrounded by rangeland which provides a contrast in views as well as interesting winding drives up, over, and around the coastal ranges to get to these groves. I visited two of these groves on a late winter weekend, the weather was spectacular. Unusually clear with temperatures near 70 in the sunny open areas and then mid 50’s in the redwood forest valleys. 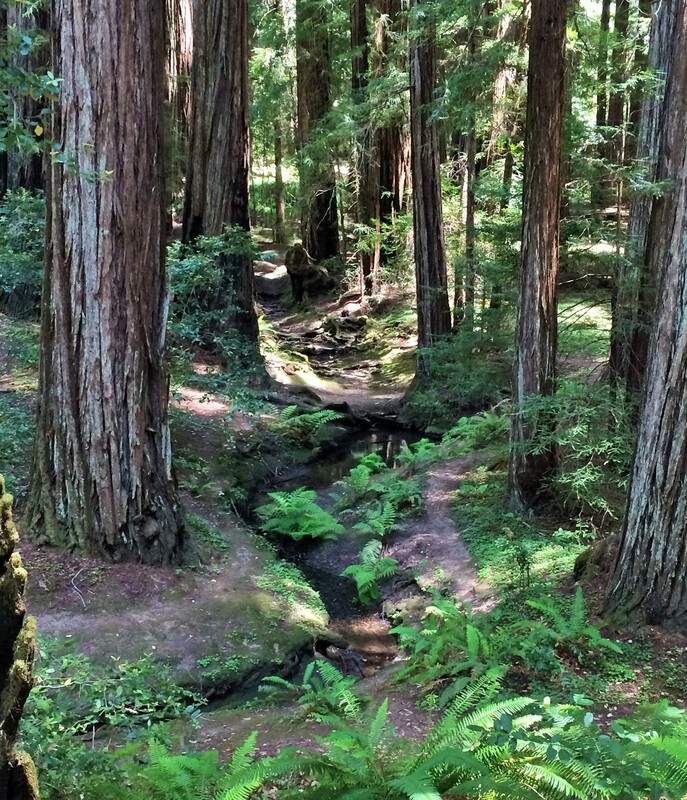 This park and its redwood groves have nine lives. The original titled owner was Joshua Hendy who was a 49’er (1849 Gold Rush, not the football team) who kept about 100 acres of his best redwoods uncut. 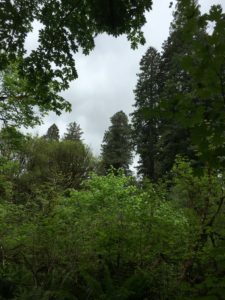 Eventually though this land was purchased by lumber companies but the locals kept pressure on to keep the 100 acre grove uncut and in the end the grove and the area around it were incorporated into a California state park. 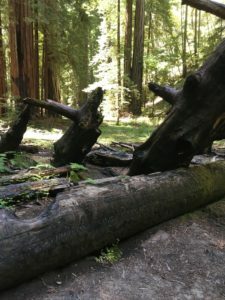 Then more recently California wanted to reduce or cease operations at the park but again local pressures and more comprehensive economic studies served to keep this park in the state park system. 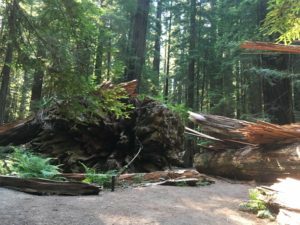 There is some construction work going on around the redwood grove parking area so until sometime this Spring (2015) visitors need to park in the camping area then take a short half mile walk downhill to the redwood groves. The groves are adjacent to grasslands dotted with oak trees. 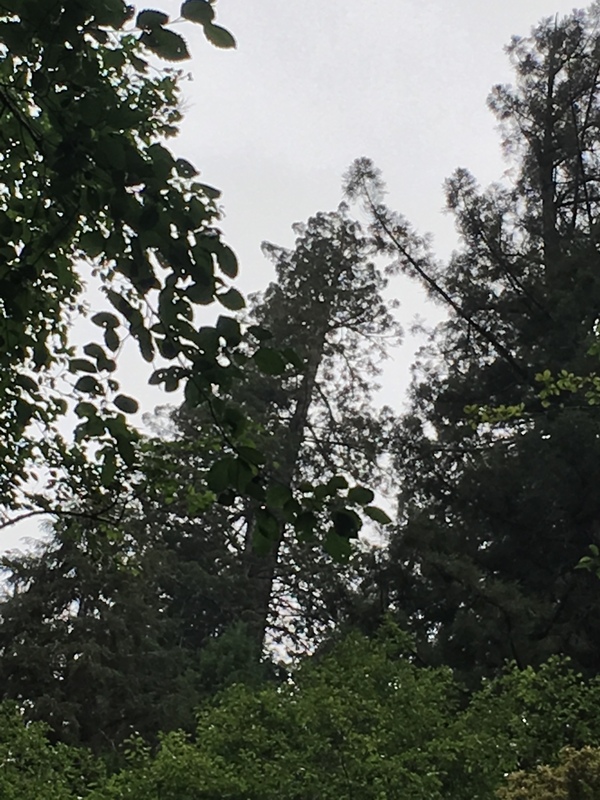 Here you can see the entrance to the redwood grove, with a tall tree sticking into the sky right where the forest starts. Because it is surrounded by open land, the grove itself is not quite as dark and imposing as some of the northern groves. Here is a typical view early on in the trail. 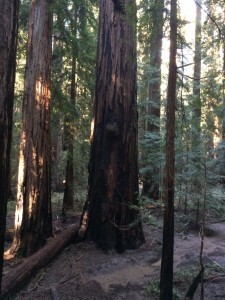 For sure there are some large and tall redwoods in this grove. The 2010 tall trees list shows six trees in this grove between 340 and 345 feet in height. 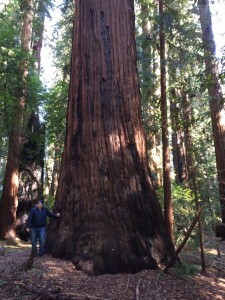 That’s really tall, even for redwood trees. This large redwood appears to be the “king of the forest”. 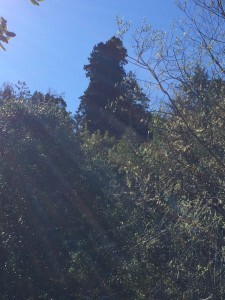 It has a 17 foot diameter trunk and is a little over 300 feet tall. That’s about 23,000 cubic feet of wood if you apply the volume for a cone formula ( pi r squared h/3) which provides a decent estimation of the total wood volume in a redwood tree. 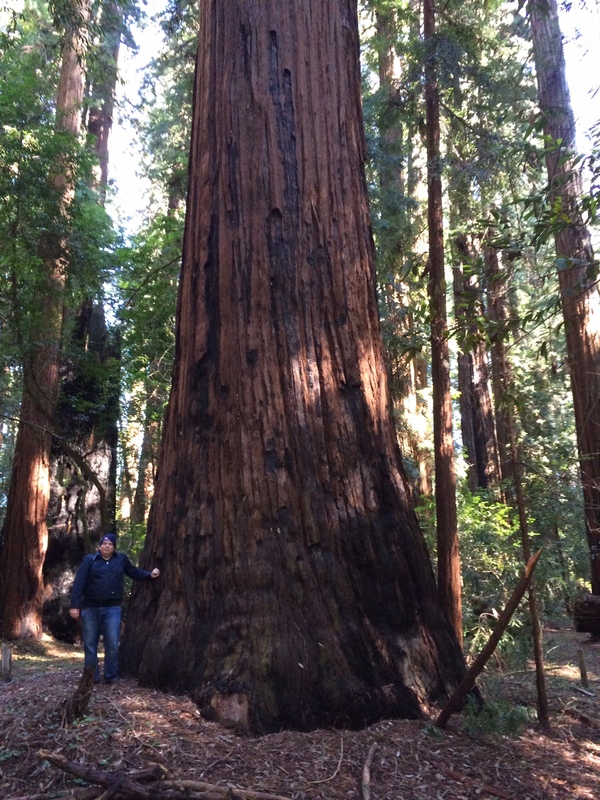 Not quite a top 20 by volume redwood (which requires about 27,000 cubic feet) but very large indeed. The trails are very well marked and the hiking is easy. At places there were open areas which I am sure are used for ranger programs and school field trips. 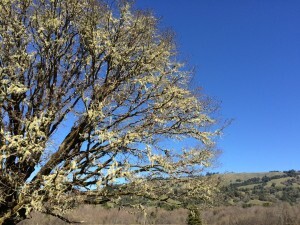 At the exit of the grove there is a nice live oak prairie. Then you can turn back around and see the forest you just walked through. Pretty cool. This reserve is known for its abundance of tall redwoods in a small area. According to the tall trees list four of the top fifty and seven of the top one hundred tallest redwoods can be found in this reserve. 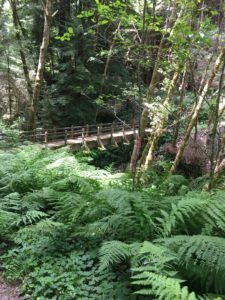 Starting from the parking area there is a short but relatively steep (250 feet elevation gain) trail up to the reserve which is at the headwaters of Montgomery Creek. Then the redwoods are in a relatively flat flood plain along the creek. 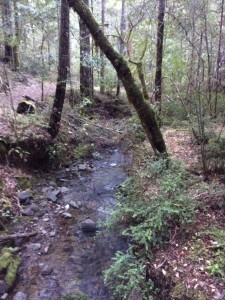 There is a 1.3 mile stretched oval trail that loops through the reserve on either side of the creek. The flood plain is surrounded by steep hillsides which help protect the redwoods from the wind. In a way this park reminded me a little bit of Pennsylvania state parks with glacial flooding history, such as Cooks Forest or McConnells Mills. Of course Montgomery has much taller and larger trees. This park could give you a stiff neck as you look up to the tops of the tall redwoods, with their upper crowns lit up by the bright afternoon sunshine. 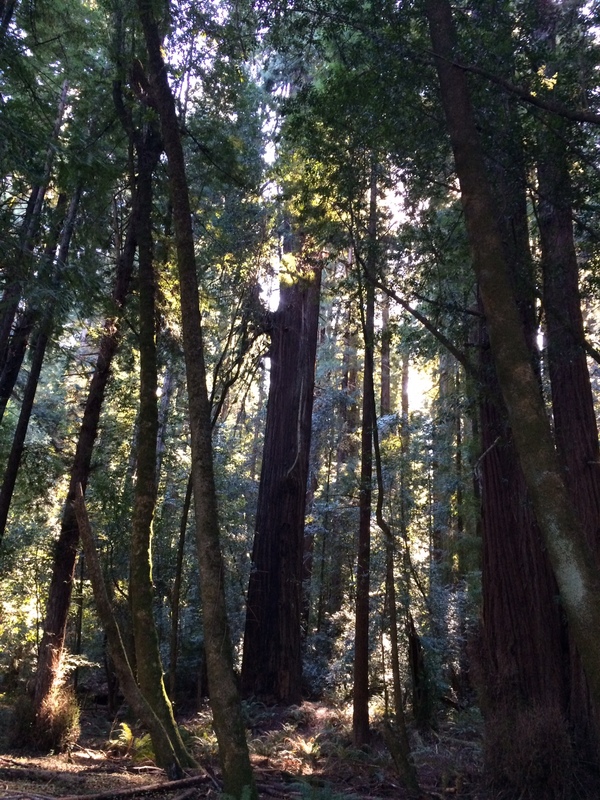 One way to assess the tallest trees is to see which ones are still lit up in the late afternoon sun. Those could be good ones to measure if you have a laser rangefinder. 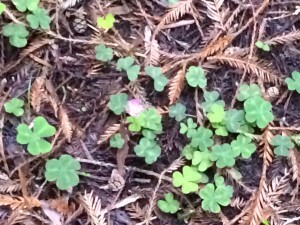 Then to even things out you can try to find early blooms in the redwood sorrel or watch the water flow down Montgomery Creek. Even on a no rain weekend you need to pick your way carefully to avoid small pockets of water in some areas. 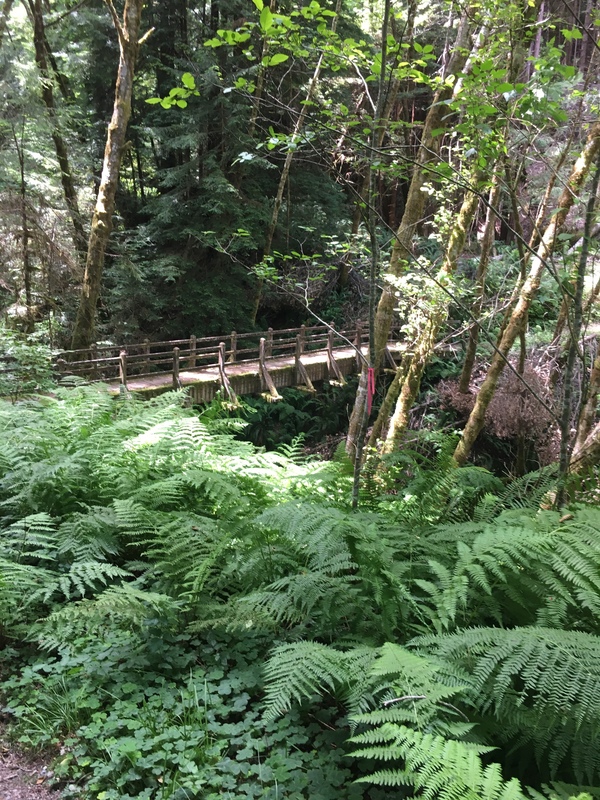 But generally the trail is a little elevated and there are also boardwalks and foot bridges through the wettest areas. Here are trunk photos of a couple nice trees in the grove. Another nice redwood in the Montgomery grove. That’s me by the tree. This is the biggest (by volume) tree in the grove, it is about 361 feet tall with a 17.3 foot diameter. 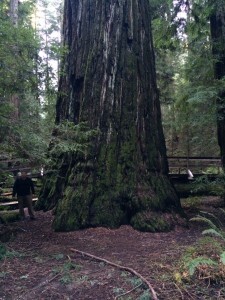 Big tall redwood in Montgomery Grove. On some days I would get wet standing where I am but not on this day. 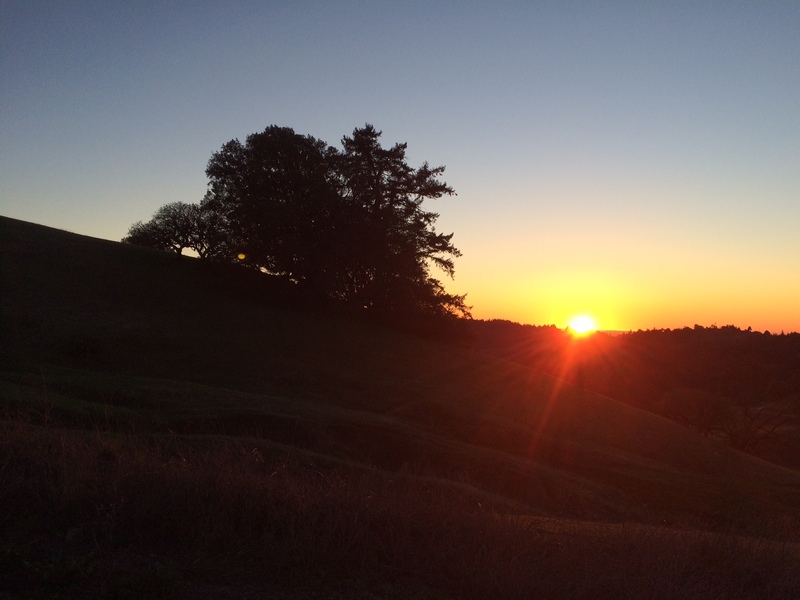 If approaching this park from US 101 / Ukiah you go up and over the coast range from the valley side to the Pacific side. The drive is winding and scenic. 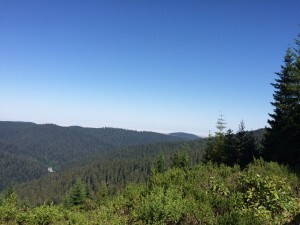 Here is a view near the summit of the coast range. 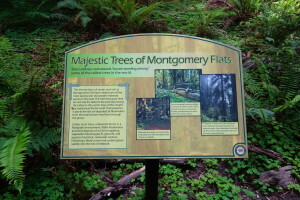 Montgomery Reserve is a popular park with a strong reputation for great redwoods which is well deserved.